The Medline Plus website asserts that children get up to eight colds yearly and that colds are the most common reason for missed school days. These colds often produce a great deal of coughing, but it's important to know that over-the-counter cough medications only ease symptoms and aren't safe for very young children. However, there are many home remedies that can help ease the symptoms of a persistent cough without the use of medication. Ten to 15 minutes of exposure to cool outdoor air can help relieve your child's cough; be sure to dress him warmly. At night, a cool-mist humidifier in your child's room can help him sleep. For coughs that are raspy or croupy-sounding, expose your child to warm steam for about 20 minutes. You can turn your bathroom into a steam room if you run strictly hot water in the shower with the bathroom door closed. This will fill the bathroom with steam, which will help your child breathe better and give him some cough relief. Be sure to stay in the room with him while he takes hot steam treatment. Gargling with warm salt water can provide some relief for a sore, coughing throat. Other cool drinks can help with cough relief and will keep your child hydrated. Stay away from sodas and orange juice, as they may aggravate a sore throat. Chicken soup, or just soup broth, with its heat, salt and fluid can soothe a sore throat. It will also help prevent coughing and will fight infection. Give your child Vitamin C regularly, through food or child vitamins. This may shorten the length and intensity of your child's illness. However, taking Vitamin C after a cough has begun has not proven to be effective. Zinc supplements can help alleviate a cough, if taken within 24 hours after the coughing has started. Check with your doctor about the safety of supplements and vitamins for your child before administering. If your child has a persistent cough and her symptoms don't seem to be getting better within 7-10 days, consider consulting a doctor about her status. Additionally, if she has trouble breathing, a high fever or rapid breathing, contact her physician. For most coughs caused by viruses, your child will likely not need over-the-counter cough suppressants except possibly to help her sleep. Consult your physician or pharmacist before purchasing any medications for your child. MedlinePlus: Common Cold; David Zieve, MD and Linda J. Vorvick, MD; February 2011. Natural-HomeRemedies.org: Home Remedies for Cough. 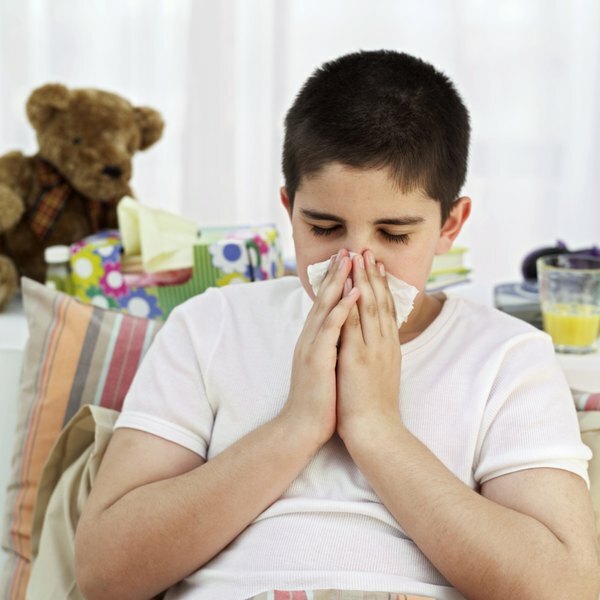 KidsHealth: Your Child's Cough; May 2011.